Courtesy of Gui Stampur (on right). At the age of fifteen, Diego left his home in Honduras after a family member had been murdered by the local gang. He and his younger sister traveled by foot, bus, and eventually La Bestia—a series of cargo trains used by migrants fleeing north, known as “the Train of Death”—looking for refuge. Many children die on this journey. Others are kidnapped, or caught by immigration agents and deported. Diego, whose name has been changed, and his sister were assaulted. They spent nights without food and water. But they survived. Ninety-two days after their journey began, they reached the Mexico-US border, only to be promptly arrested by border patrol. Their case was transferred to a New York court, where Diego faced a new challenge: convincing a judge to allow him and his sister to remain in the United States. Diego did not understand his rights. He did not know how to advocate for himself. 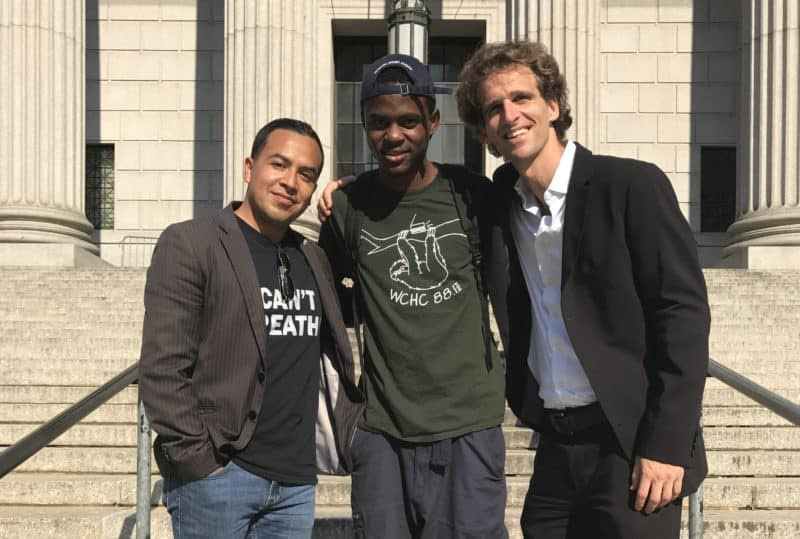 He spoke no English.Just prior to their first court appearance, Diego and his sister were approached by lawyers from the Safe Passage Project in the hallway of immigration court at 26 Federal Plaza. Safe Passage’s attorneys, who can often be found at the court looking to serve unrepresented children, offered free legal aid. They helped Diego and his sister obtain Special Immigrant Juvenile status, a protection for foreign children who have been abused or neglected and face significant risks in returning to their home country. Two years and seven court appearances later, the siblings received their green cards. Diego has since graduated from high school and is saving money to attend college. He wants to be an actor or a lawyer.